Do you remember the dreams you had as a child about your future? When someone asked you what you wanted to be when you grew up, chances are you responded in a conclusive manner. You could tell someone exactly what you were going to do in order to become a firefighter, pilot, actress, writer, sports star, musician, or a veterinarian. These visions were a source of motivation teaching you valuable lessons about ambition, sacrifice, and perseverance as you explored how to achieve your dreams. You experienced challenges and setbacks as you pursued your dream, yet you continued to persevere…until one day you found yourself at the crossroads of adulthood. You stared down two paths. The first was a rocky and tumultuous path filled with unknowns that could lead you to the career you dreamed about all these years. The second path was a safer more predictable path, that led you toward a career with more certainty. You had to make a decision, so you weighed out each scenario in your mind and allowed the “what if’s” to creep in and challenge your dreams. As you answered these questions, doubt emerged, and eventually you convinced yourself to abandon the dream and pursue the alternative path. The emotional security that path provided felt like a safer place to be than embarking on a journey down the rocky path of the unknown. Fear is an instinctual reaction influenced by assumptions we make from past experiences. We use these assumptions to make sense of new experiences. You can witness this phenomenon if you watch a young child climbing on the playground. The child is immediately drawn to the brightly colored rungs of the ladder and fearlessly grabs ahold and climbs toward the top as quickly as possible. The child is completely unaware they could fall and get hurt… until he senses his parents hovering behind him watching and waiting to catch him IF he loses his footing and falls. Then the child begins to feel fear, not because he knows he could fall, but because the actions of his parents cause him to believe something bad COULD happen. He becomes apprehensive about taking the next step, hesitates, and works his way back down, opting for the safety of the known. Fear is designed to keep us alive, but it can also keep us from living. It’s like buying an expensive, sporty, convertible and not driving it because there is a chance it could get damaged. We keep it in the garage and deprive ourselves of experiencing the exhilaration and joy of driving on a sunny day with the top down and taking in the beautiful sights. We do this to protect ourselves from the heartbreak we could experience IF our beautiful car gets damaged. So, how do we become the people who can combat our doubts and convert our fears into courage and motivation? What does it take to embrace our fear, accept our vulnerability, and launch ourselves into the unknown to pursue our dreams? Embracing your fear is the first step in taking back your dreams. Fear is natural, instinctual, and to be expected. Instead of letting it paralyze you, allow yourself to lean into it. 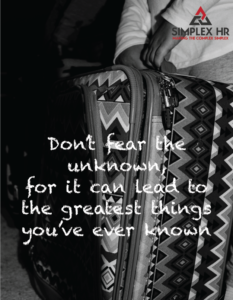 Don’t let your fear the unknown prevent you from moving forward. Start small by making simple steps toward your goal. As you complete each step, you will gain confidence and insight that will make the unknown seem less scary. Let this confidence empower you and accompany you down the road to success. Fear is an illusion or fantasy we create in our heads about what we think could happen. If given enough attention, these figments of our imagination can creep their way into our reality and onto the pages of our story. We become the stories we tell ourselves. 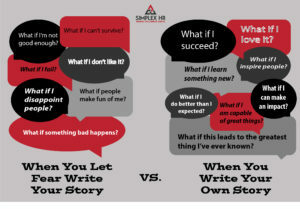 Stop terrorizing yourself with stories of doubt. Regain control by filling your pages with positive expectations of your future and continue to focus your attention on those stories. Humor and laughter can help us cope and put our fears into perspective. Laughter neutralizes feelings of tension and anxiety. When we laugh, we feel strong, resilient, and hopeful. Learn to laugh at your fears. When facing into my fears, I try to imagine the worst possible thing that could happen and then I exaggerate those scenarios into the most outlandish stories possible. This helps put things into perspective and allows me to see how absurd it is to put my life on hold for something that is not real.